Skepticism is my middle name when it comes to any claims that certain foods or food products are healthy. I’ve seen too many food fads come and go and too much science change to believe any of it is permanent these days. That skepticism was confirmed by this recent article talking about seven foods once thought of as healthy that really aren’t. Restaurant salads are not good for you. 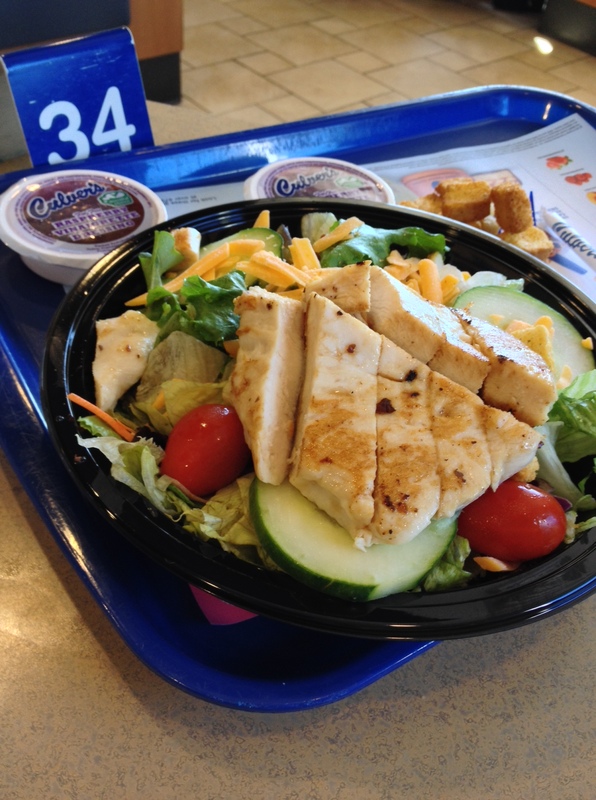 Too much salt and sugar in dressings and on chicken like this Culver’s salad. 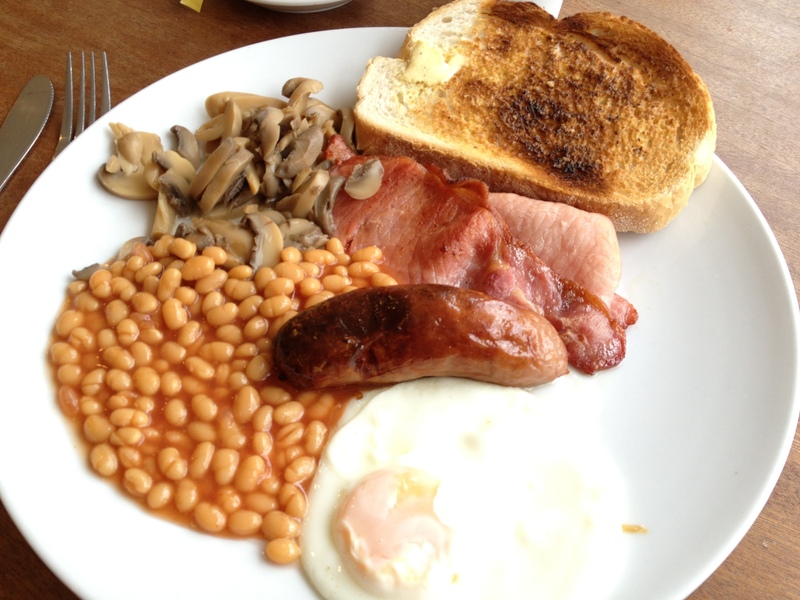 Restaurants and sodium, i.e. salt, seem to go together like fire and heat but from time to time I get a little encouragement that the foodservice world is starting to get the message that people on low-sodium diets would like more options when they eat away from home. Recently, this press release from the Centers for Disease Control and Prevention came across my virtual desk, talking about efforts to cut sodium in restaurant foods. Restaurants are hooked on using too much sodium in meals like this. Hopefully that is changing. I miss cakes and cookies so much since my angioplasty, but I’m restricted to no more than 40 grams of fat a day and 1,200 mgs of salt, so baked goods are largely off my plate these days. 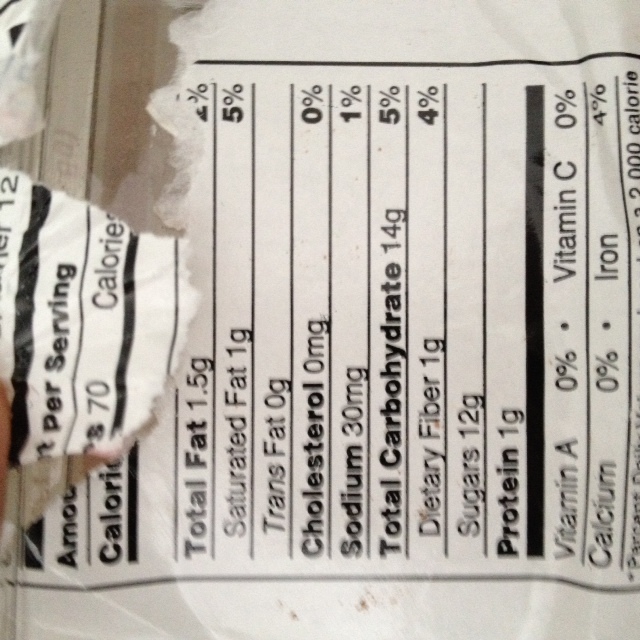 I’ve been searching for some that are low- or no-fat and low- or no-sodium at the same time, with some good results. 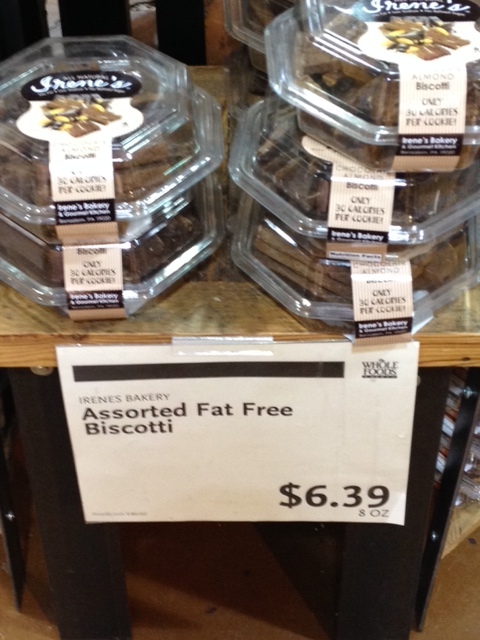 A favorite is Irene’s fat-free biscotti slices carried by Whole Foods and until recently by my local Jewel supermarket. Irene’s biscotti slices are expensive, but good when you crave something baked. Finding low- and no-fat cookies is a challenge. Baked goods also have lots of salt in them, so it’s really a double challenge, and a discouraging one for someone like me who loved baked goods before my angioplasty. I’ve written about SnackWells chocolate cookies, which are fat-free. But last week, I found a really great new option at Whole Foods, low-fat chocolate chip cookies that are incredibly chocolatey, and are relatively low sodium and low sugar (for a cookie anyway). Chocolate chewies, I’m lovin’ ’em. 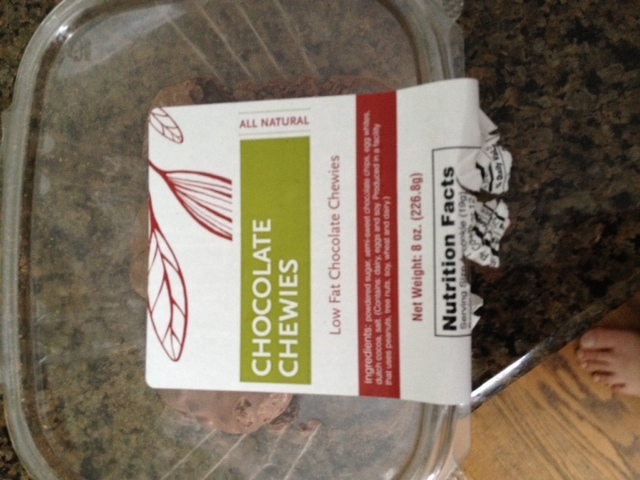 Nutritional info for chocolate chewies. This looks like a fun recipe. To make it no salt, no fat, no sugar I would leave out the capers (salt), the sugar and substitute fat-free cheese for regular cheese (fat). I’d also opt for a whole wheat or multigrain pasta like Barilla Plus which I’ve written about before. The Paleo Diet has surfaced in our constant quest to find magic bullets for how we eat in America. It basically advocates going back to the type of diet are far distant ancestors ate while they were hunting and gathering. It’s always sounded a bit wacky to me and U.S> News seems to agree with me in its latest rankings of various diet plans. 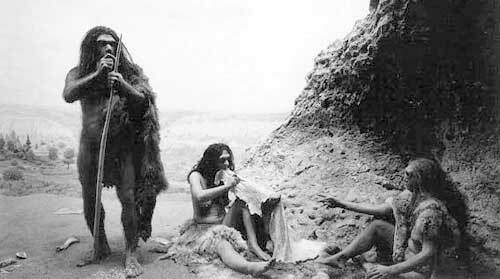 Feeling like a caveman? Better not to eat like one. Bison is leaner than beef, I’ve written about that before and was reminded of it during a recent dinner at a Ted’s Montana Grill in Glenview, Il. Ted’s is a national chain started by Ted Turner that specializes in bison items like bison burger and bison steaks. We’ve been there before and enjoyed, so I suggested to my wife that we forego our usual Saturday night salad buffet and go to Ted’s instead. 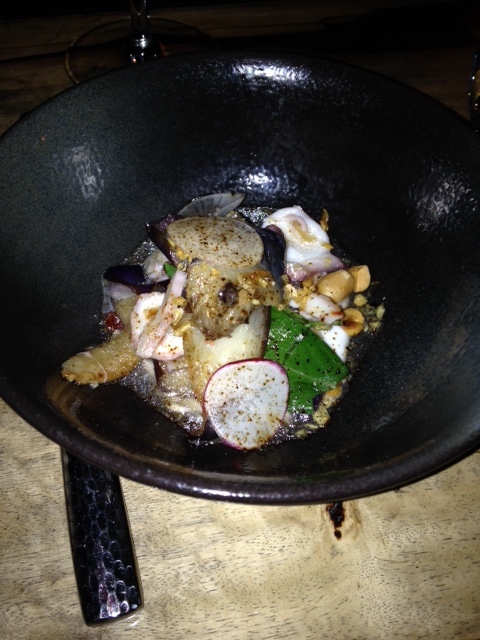 The meal was great and my request for no salt was met, with one rather odd exception. 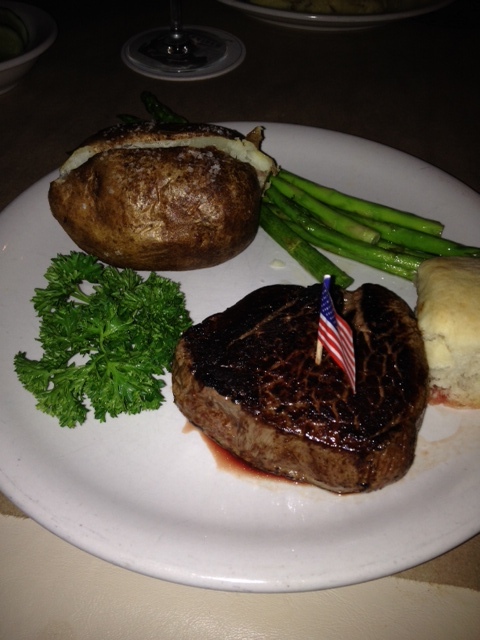 I ordered the bison fillet as a main course, without seasonings, salt or the lemon butter it normally comes with. That’s exactly what Ted’s suggestions on a special dietary information page on its website. I give the chain credit for having that information but the sad part about it is that the information basically tells you all the things on the menu you can’t eat if you’re on a heart-restricted or diabetic diet. 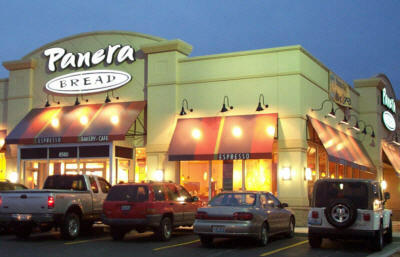 Wouldn’t it be nice if instead everything on the menu was ok for everyone to eat? My great dinner at Ted’s. I left the white roll but everything else was terrific.